The City Rail Link really seems to be moving forward at the moment. Physical construction on the first sections are no wel underway and progress on the main works from Wyndham to Mt Eden are at various stages of the tender process. Below are a couple of recent bits of news about the project. The CRL team are also holding a Q&A session on their facebook page at 1pm today if you’re interested. AT has done a good job of using temporary activation on Lower Queen St over the last almost 18 months since this part of the street was opened to people. The artificial grass has proved popular and shown that even in the middle of a construction zone, people are happy to sit and relax. But that’s about to come to an end as construction ramps up. From May until 2019, the area in front of Britomart Train Station that has been an inner city lawn and public space for the past year will become a City Rail Link (CRL) construction zone. Although the space is surrounded by construction zones, the transformation has proved to be popular with visitors and locals alike, especially over summer when deck chairs were used daily. AT have shortlisted companies for the first major tender. There are a number of different tender processes going on at the moment and the first one has reached the point where companies have been shortlisted. AT have said before this tender has to happen first to help inform the other parts of project. Three companies have been shortlisted to tender for linewide systems integration, testing and commissioning for the City Rail Link. There were eight international expressions of interest for the work and three have been selected to move to the request for tender phase. Earlier in the month they announced eight companies had passed the pre-qualification phase for the eventual contract to build the tunnels and stations themselves. With pilling complete, Albert St is going to start looking much more like a trench soon. ‘Gomer’ – the nine-storey-high piling rig affectionately named after 1960s TV character Gomer Pyle – began piling in September last year. Each pile was drilled to a depth of 20 metres and filled with reinforced concrete, which will support the trench walls within which the CRL’s twin tunnels will be constructed. Connectus, the project’s contrctor, is now forming the concrete capping beams which will be placed on top of the piles to tie them together. Steel I beams will then span the width of the trench to brace the piles. This marks the start of construction of the ‘cut and cover’ tunnels across Customs Street and up Albert Street to Wyndham Street. “It’s been a real feat of engineering completing the works in an environment filled with a large number of underground services – some of which date back more than 100 years and for which little to no records exist – all the while maintaining vehicle access around the site, albeit under restricted conditions. Earlier in the month, AT shared some interesting infographics about the number workers and hours that will be spent on the project. The first one shows how many hours will be spent on the project broken down by area. And the next one shows how many people they think will be working on the project each quarter. Presumably this is only for the main works given there is nothing prior to 2018. Matt – swirly bits on the Q St plan – any idea what they are? Really expensive markings in the concrete. I’m just disappointed the wonderful covered walkway isn’t being replaced. Why on earth would you have a covered walkway directly underneath an uncovered walkway? Not sure those markings in the concrete would really be that expensive, I imagine getting purple concrete will be where the costs really start adding up. Looks like it could have been contour lines, or a water feature…. is the architect for this still Jasmax? Or is someone else doing the landscaping? With Auckland’s rainfall it would be reasonable to expect some form of shelter but that seems to be something the designers don’t want to allow for. It’s for walking from one side of the street to the other! We don’t provide pedestrian subways at other busy spots further up Queen St.
That is the new high tide level after Trump dumps the Paris agreement. I like it, reminds me a bit of Venice. Is that something like a paddle board amongst the aquatic shrubbery? Yeah, not sure why that thought that was wise to bring to the public’s attention! I’m very puzzled that there doesn’t seem to be a cent for design. That can only mean one of two things: either absolutely all the design is done, and there is no need for any more, or alternatively: there is no design at all in this project, just management. I don’t believe the former, and I don’t like the sound of the later! Perhaps design falls into the management category? 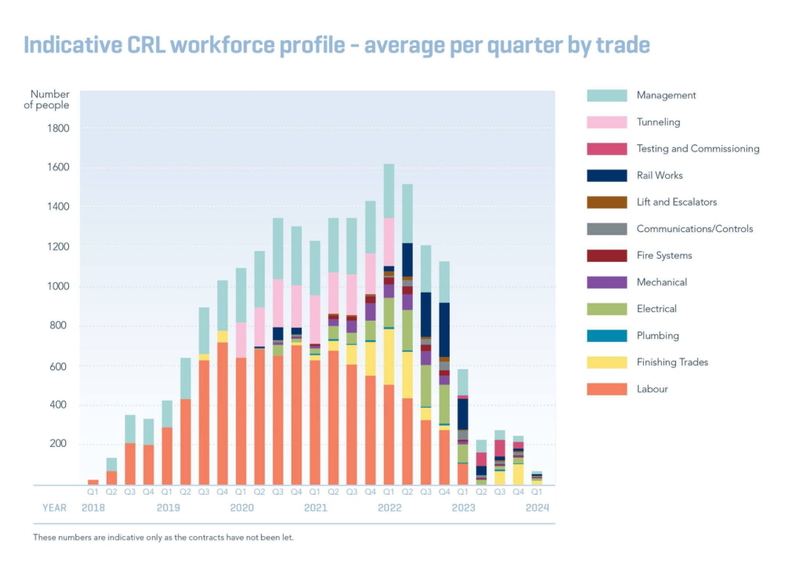 The graph shows the indicative split of hours by discipline for the Construction phase so probably assumes that the major design activities will have been completed previously. Any multi-disciplinary, highly complex project like this needs a SHEDLOAD of management. Not in the Dilbert sense – it simply is necessary to make sure all things line up, both physically and metaphorically. 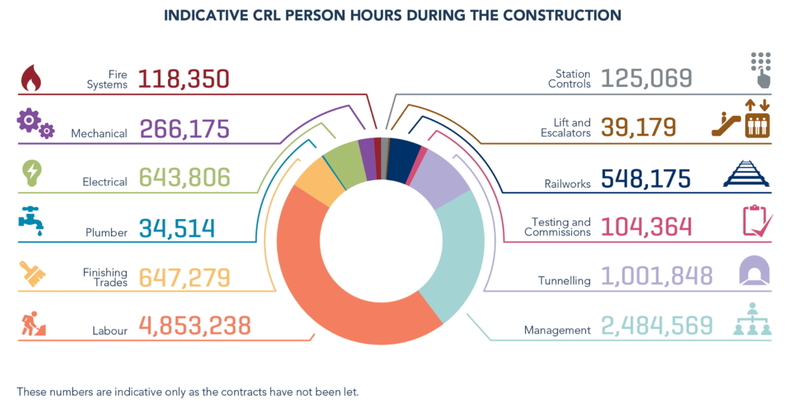 Considering this is mainly a twin bored tunnel underground rail project [with a side serving of cheaper cut and cover] the time spent on “tunnelling” activities is pretty small in the overall part of the project. Imagine what the same breakdown would look like for the Twin bored road tunnels required for the proposed (road, with PT on the side] AWHC and that would explain why its going to cost a lot, lot more in time and $ to build that. Then instead extrapolate the CRL breakdown above just a little, as this is all it would need to be for the across harbour twin bored tunnels that a [rail] based PT link to the shore would require. The actual tunnelling part would not be that much different for a PT only AWHC pair of tunnels, so overall the project time and allocations similar to the above. Even so its a big project. But then, so was the yet to open Wateriew tunnel project. And I bet all the “decongesting” benefits of that are long gone by the time CRL is opened. Maybe we need to start planning for that PT only AWHC crossing now so we have it underway by the time the CRL project starts winding down early next decade? Make a change from the one PT project at a time myopic mentality we have now. Is that public lane running through the Commercial Bay development to scale? It seems wider than what the developers are proposing. If so, then AT graphics dept should stick to the facts. That’s a whole subject in itself. Trees, for example, are often drawn in where none will go. And the lovely graphics of the Waterview Connection showing South Island style spacing of cars. Looks good. Of course going by this there is no planning in place for LR to run through lower Queen St to Quay St. 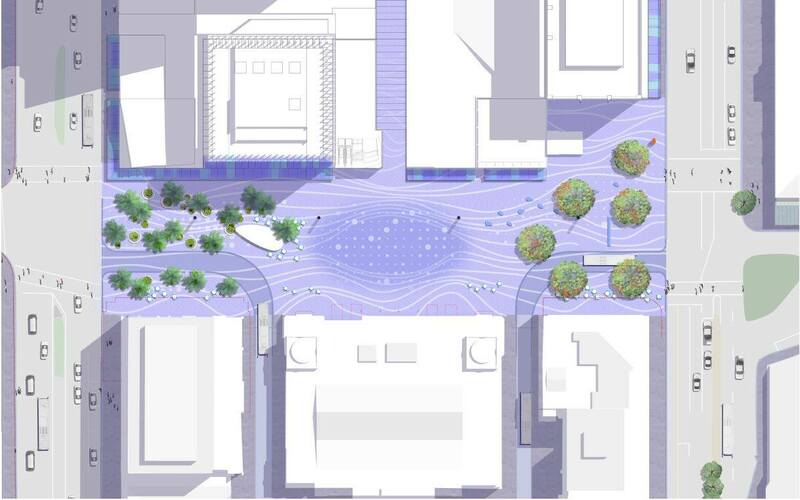 So rip out half of the square again to do that and spend $10m doing that in typical Auckland fashion rather than leaving a clear path through the middle for LR to eventually be built on. Sure $10m (or whatever it is) isn’t a huge amount in the grand scheme of things however it all adds up. Collectively AT must waste 10’s of millions every year throughout this city (things like replacing signs that don’t need replacing just because they have reached some timeframe – there goes another $300, rip up a perfectly fine footpath again because it has reached some particular timeframe – $2000. Replant a roundabout because the previous plants have overgrown it that it becomes a sightline hazard every few years – here’s an idea plant plants that won’t grow any larger! All of these things add significantly to the budget costs of AT when that money could be used to buy more buses/trains/buslanes etc). Likely because AT have chosen a Customs/Fanshawe alignment to Wynyard rather than using Quay St.
About 40 years ago they removed traffic from this part of Queen St, then about 20 years ago they opened it up to bus traffic again. It is important we get on with removing traffic now so that someone else will be able to let it back in 20 years from now. If we don’t act soon we will be remembered as the generation who failed to reverse previous changes on time and slowed progress down. And if they want to plan further ahead, why not leave room for the LR/Tram to run across Quay St and onto the wharf too? That way people could get off the ferry, hop straight onto a tram and then proceed up Queen St. Otherwise they will have to wait and cross the street. Yeah, looks rather car-centric. Also a tiny footpath, massive sweeping entrance for vehicles onto “The People’s Wharf”. I doubt this is what they are actually planning, but it does show what goes on in way too many people’s heads still when asked to throw together a future layout for things.